I’m Yu, a first-year CMS graduate student and RA in Center for Civic Media. I like building things together with people. I’ve lighted up my skill tree as a researcher, web or non-web programmer, a media producer and (sometimes) a designer. Oh, I’m working in the NGO20 project. Browse the map or follow us on twitter if you’re interesting in what’s happening in China’s nonprofit organizations and creative technologies for public good use. I signed up for this course because I’d like to experience interacting creatively with the world through co-design methods, as well as meet the local community, and all the lovely people inside or outside campus. The mass-surveillance topic also gives me a chance to learn how people set their steps in the maze of such a complex cause. For “the day we fight back” event, I joined the 5000 websites and installed the code on my MIT personal homepage. It is a large banner describing the arguments of the activity and what kind of action the visitor can take; the banner does not block the function of the website, and it disappeared in the next day (though I didn’t remove the code). It’s a natural tendency to compare #StopTheNSA with “Stop SOPA” action. The latter one is more successful perhaps because of its obvious connection with the interest of big Internet companies such as google. “Stop SOPA” tries to stop an act, while “Stop the NSA” try to get an act passed. Though I doubt what the legislators may think when they are flooded with emails and phone calls with exactly the same content. Also, I appreciate this american boy (video) who argues that everything wrong with the action is that people should have their OWN voice instead of repeating someone else’s mechanically. I’m also interested in the symbols or icons used in the action. In “Stop SOPA”, a simple black out square is adequate to convey the idea. 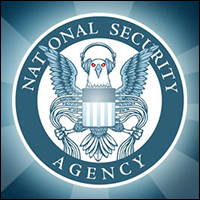 In “Stop the NSA”, the “slap in the eye” symbol and the scary red-eyed NSA eagle are used in the action. Somehow I feel that it is not that intuitive in compared with the black out square. What do you think about it? This entry was posted in Introductions by wangyu. Bookmark the permalink.